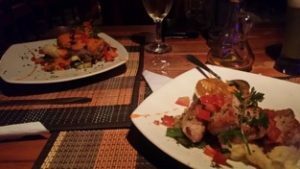 The ultimate guide to eat & drink in Santa Marta city, Colombia. Welcome to Santa Marta! What a better way to start this experience than with a delicious colombian dish? After so many hours on a bus or a long plane ride, you will definitely need to pamper yourself with the different varieties that this city has to offer. Normally when you think about this destination, the first thing that goes to your mind is sea food and although we have a lot and delicious sea food, at this moment the city is offering a lot of options, the main reason is due to the foreigners who make this city as their home and they manage to bring with them different mixtures from all over the world, fusing them with the flavours of the Colombian Caribbean. What better restaurant to start than this? Definitely your certificate of excellence on TripAdvisor is more than deserved, I recommend it for those nights where you want to enjoy a romantic dinner in the historic center of the city, its menu is based on Mediterranean food, delicious baked pizzas, desserts and traditional cocktails but with their personal touch and homemade sodas. After finishing a little trek in the Sierra Nevada there is absolutely nothing better than recover energies with the best burgers in the city, this retro restaurant has one of the best customer services in the area, its working group are young people who are always attentive to please the customer, the specialty of the house are gourmet type hamburgers, homemade bread and daily fresh meat, refreshing drinks and if you are on a diet, do not worry! 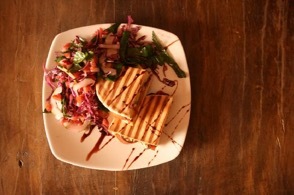 Their salads and vegetarian dishes are delicious and plentiful. Tip: they have air conditioning but nice tables around the bride and groom’s park. Schedule: From M- S from 15pm to 23 pm. Lets talk about drinks! Santa Marta is highly proclaimed as the pearl of America being like that, it has one of the most beautiful and calm sunsets I have seen in my life, without doubts that Caribbean Team is the best option to enjoy it, gather your group of friends and enjoy the delicious bites, natural lemonades and cold beers that this place has to offer! Tip: They sell some delicious palettes, do not forget to bring your sunglasses and a camera to see beautiful sunsets. 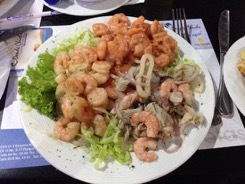 Santa Marta and the specialty of the house: sea food. Impossible to be on the Caribbean coast and not go Donde Chucho, not only has a great reputation among locals, but its long experience, make this place one of the favorites to visit, by famous national and international celebrities. 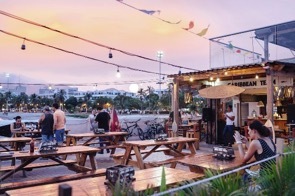 They have several locations in the city, my favorite, which is located in the Parque de los Novios, one of the star dishes: Salmon al ajillo and shrimp cocktail, do not forget to order it with a delicious michelada! Alfaix is ​​the secret of locals, after a night out or before taking the bus to start your journey through the Tayrona Park, this is the place to recover or prepare. The portions are large, the Orange juice is natural and the place is indigenous to our region. Tip: Breakfast is their specialty, and sundays have live music. 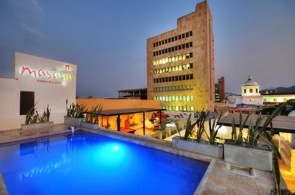 Sundays are beach or pool day in Santa Marta and Masaya has one of the pools with the best view of the historic center, beers, cocktails and natural juices, only pay the value of the ticket and enjoy live DJ with people from all over of the world! Address: Cl. 14 # 4 – 80, Santa Marta (Historical and Cultural Tourism District). In the village of Taganga everything is magical, this place it is well known with the famous saying “get out if you can”, one of the reasons is this restaurant with international asian speciality, hidden in small cabins with sun views and friendly local staff, this place can be reached by bus from Santa Marta only 15 minutes away. The strength of this place is definitely the three-course dinner offered with: appetizer, main course and dessert, accompany it with a glass of wine or one of it’s craft beers, this experience it’s for sure you will enjoy the best dining experience in Taganga. Tip: The best smoke soup in the whole city. Address: Next to Tayrona Diving Center, Street 1C # 18-22, Taganga. I could not miss the famous menu of day in Colombia! 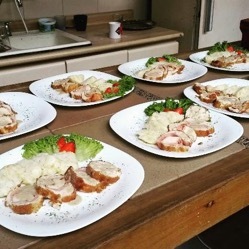 If what you are looking for is economy, quality and a nice place to have the most typical lunch in the area,La Chatica will not disappoint you, their dishes combine local food with a gourmet style, lunch is their specialty. Tip: Do not be surprised if you’re the only foreigner in the place! 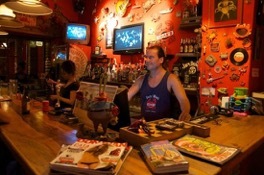 The rock & roll style is the king in this bar, and the best? The decor is amazing, they use bath tubs like chairs, they have autographed rock star disks, costumes, a pool table and a secret terrace! The hit of the bar are the pitchers of beer, 1 liter of beer that you can share among friends, or for the most daring, bet who finishes it first. The owner is a well-known public figure in the area of ​​the city, talks with him are very interesting and full of musical culture. Tip: If the hot wheater in the city is something that affects you, do not worry, this bar has an amazing air conditioning system! The healthiest option on the list and with one of the best ratings on TripAdvisor this restaurant is still positioned in Santa Marta as one of the best options to enjoy on a Saturday night, is located in the Callejón del Correo, one of the most beautiful streets of the city, where you can enjoy live music and delicious pitas, accompanied by organic juices. With this amazing list of restaurants, sit down at our table and enjoy as a local, the gastronomic flavors that Santa Marta has to offer! Did you like what you read? Pin it to save it or share it with someone! you have done a great work ... because you explained every thing what to eat in Colombia which will be helpful to others. Hi Swikriti, we all glad you like our content! We are looking to show to tourists all possibilities they have to enjoy this destiny in caribbean colombia. Thank you for your comments! A great list! Next time I visit, I’ll refer to this. Thank you for sharing! Be our guest!.. Looking forward to meet you and for you to have the opportunity to meet this beautiful point in Colombia. Be our guest Sammer, we'ld be very happy to have you here, Colombia have so many beautiful places to see and enjoy that you can't really miss this destiny! Best. This is a great list of places to eat I will pin this for when I actually get to Columbia as I want to try all of these places as I am now drooling over the pictures. Thank you for sharing! People have to know that Santa Marta have amazing places to eat and enjoy a fun time while their vacations, we await for you also! Come to visit us soon! 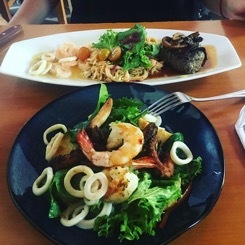 Eric, if you love sea food, then Santa Marta have to be in your bucket list, although as you can see, it is not the only one kind of food you will find here, but definitely is one of the best. Hola Maria, creemos que podemos alargar la lista aún más!, tienes alguna recomendación que hacernos? Nos encantaría saberlo, saludos! Yes when I think about Santa Marta, I do think it will have sea food on offer. But you took me aback with the plethora of options available for a food lover. Brings vegetarian by birth and choice I am glad you have enlisted vegetarian options too. Radio burger sounds like an interesting name. We would love to visit South American continent someday and Brazil, Colombia top our list. I hope to read more about this lovely continent from you in future. Thanks. Hi Moimehr, Than you for your comments!. 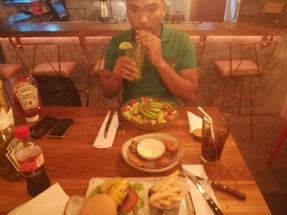 We are waiting for you, we are sure you are gonna have a wanderful time here in Colombia and South America as well, and the option for vegetarians are plenty! A foodie like me would certainly love to try local authentic dishes. Will check it out if in case we can come and visit Colombia in the future. Sure Liz! We are waiting for you, you would really enjoy your time here! I have traveled to Colombia and loved everything about your incredible country. Though could not visit Santa Marta but glad to have all the depiction in your post. Hi Indu, Then you have to come here! Santa Marta have too much to offer, surronding by jungle (Sierra Nevada) and the most amazing natural park which Tayrona Park, definitely Santa Marta have to be in your bucket list. 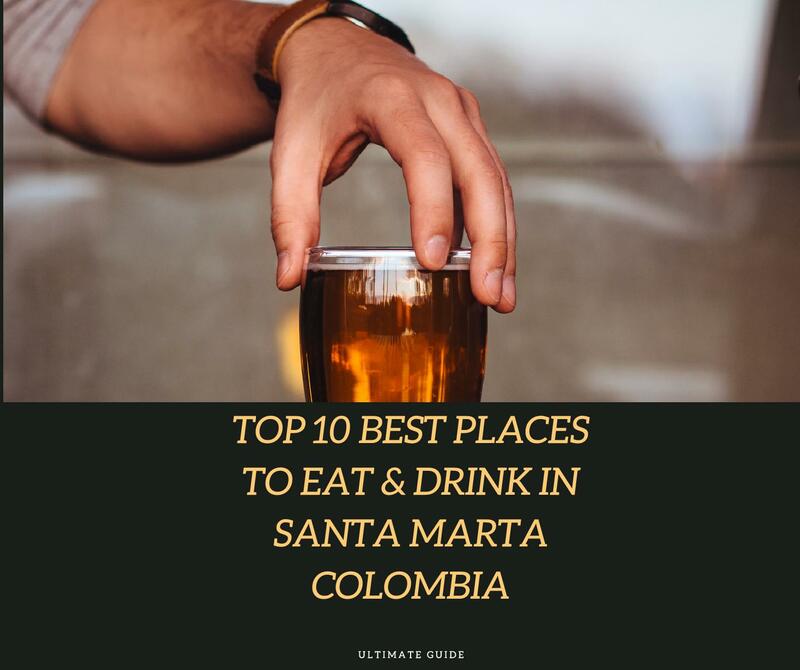 I have never heard of Santa Marta, but with all this delicious food and drink you've introduced us to it seems like a place I definitely want to explore! Hi Meaghan, Sure! you have to come to Santa Marta, this is an amazing place, near from Sierra Nevada and Parque Tayrona, definitely have too much to offer, and with this kind of post we are looking to promote this beautiful destination. Nice recommendations Greici, I'm looking forward to try the authentic places! Hi Matt, Thank you for you comments! Yes you have to try this amazing dishes, im sure you would love it! What a lovely list of food places. As a food lover I love all this food display, I would probably chooose Caribbean Team and Ouzo to visit and eat those delicious foods. wonderful post! hopefully I can visit Colombia one day.